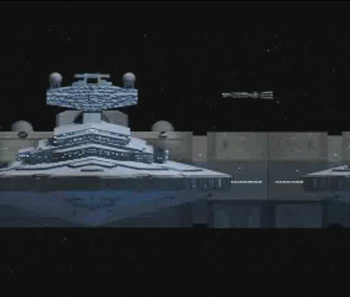 Tour IV Scene 4 is a cutscene where a Corellian Corvette is used to attack an Imperial shipyard. It is from Star Wars: X-Wing Tour of Duty: Imperial Pursuit. It was the first expansion pack for the Star Wars: X-wing video game, providing new missions for players. It was released in 1994. The Star Wars: X-Wing Video Game was the first LucasArts DOS game set in the Star Wars universe that was released in 1993. A space combat simulation computer game that attempts to simulate the fictional experience of starfighter combat, while remaining faithful to the canon movies. Players assume the role of Keyan Farlander of Red Squadron, a Rebel pilot who served in Independence and fought in a number of key battles before, during and after the Battle of Yavin.